As third base umpire Jansen Visconti ruled that Ricky Hague interfered on the turn of a double play, the Senators ninth-inning rally fell short. Manager Matt LeCroy sprinted out onto the field yelling at Visconti to no avail. One hour later, LeCroy was once again sprinting around and yelling. 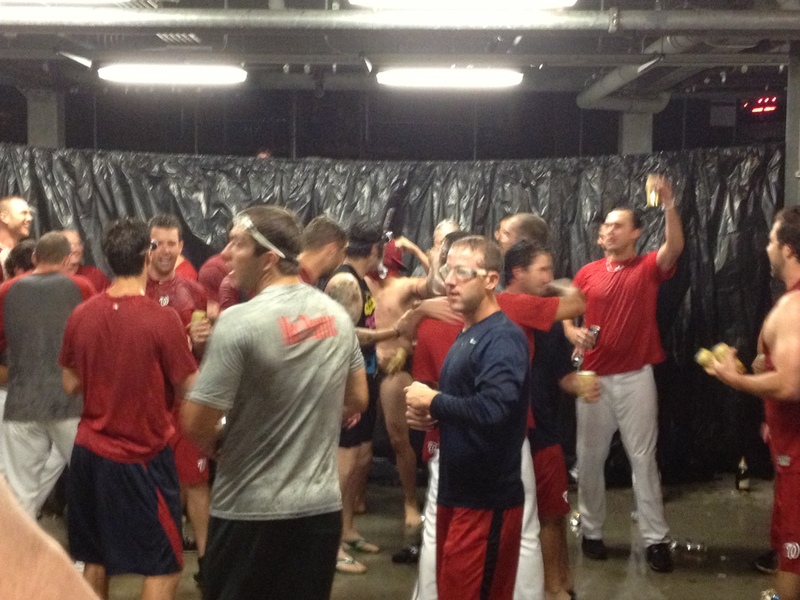 But this time, it was in the clubhouse as Reading defeated Richmond and secured a playoff spot for the Senators. The 4-1 loss to Altoona left a bitter taste, but it was washed away as the players and coaches huddled around the live feed of Reading’s stirring comeback. 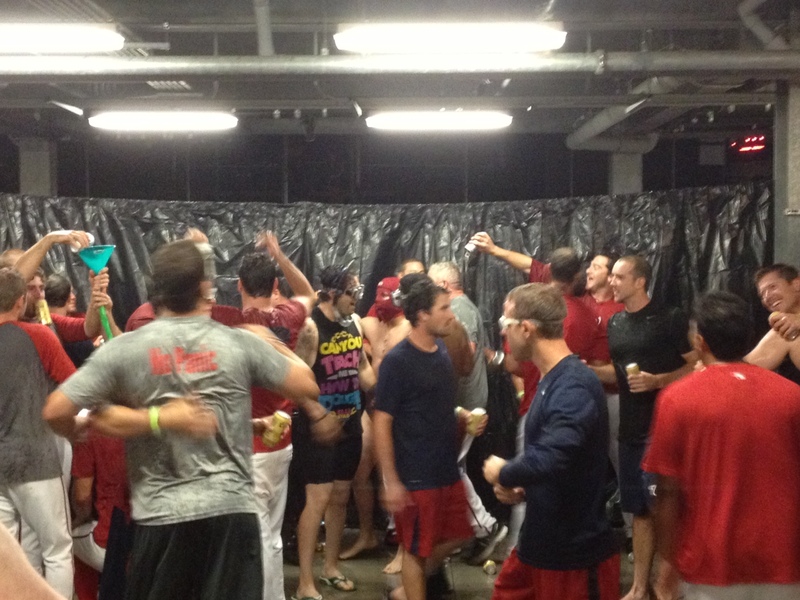 The celebration poured out into the concourse just outside the locker room door. Champagne was popped and sprayed, cases of beer were consumed, and speeches were given. Steven Souza addressed the team from atop a folding chair and spoke of the injuries and promotions that have affected the club. He praised LeCroy for guiding the Senators and pulling them together as a team. • Prior to the game, the Senators Fan Club gave out their annual awards. Jerad Head was named the Offensive Player of the Year, while Ricky Hague took home the Defensive Player honors. Nate Karns was honored with the Pitcher of the Year and Sean Nicol was easily named the Fan Favorite. • Aided by the entire Senators’ bullpen holding back Bingo and Bongo, Steve won his first ever Monkey Race. 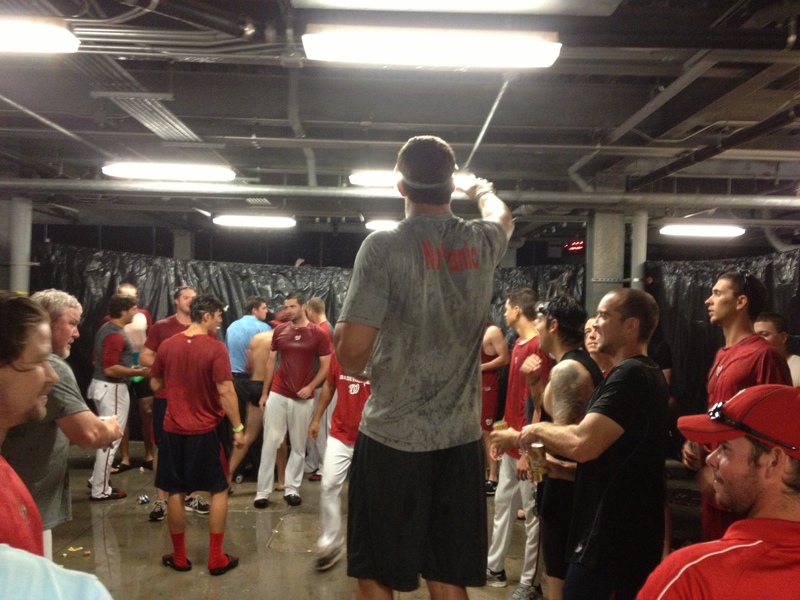 This entry was posted in Recaps and tagged Harrisburg Senators, Jansen Visconti, Steven Souza. Bookmark the permalink. Watching calls like this one in the Eastern League makes it easy to see why umpires in the Major Leagues so often get it wrong. Just as Double-A is the learning ground for ballplayers, it is similarly the learning ground for all the incorrect positioning, bad judgement, and terrible attitudes amongst the ranks of umpires. Oh for the days when umpires were simply seen in the background, made the call DECISIVELY, and did not try to confront players with each and every call. Seems like today’s officials look for ways to “put a player in his place” rather than just making the right call and maintaining control of the game. Why was Hague called out in the first place when clearly the shortstop was NOWHERE NEAR THE BAG when he received the toss from the 2B??? Hague was actually the closest player to the bag, and he gets pinched for interference??? Go figure. Blue just don’t know what blue’s talkin’ a bout anymore! Can’t trust him. Can’t play with him. Can’t win with him!! !